Hi I'm Suzie. I'm a 35 year old single parent and I run my own cleaning company. Being the main person of the house, I never had time for myself. I had lost 'me'. I didn't have enough time or energy to focus on myself and I neglected myself whilst I cared for others. I put on a lot of weight and walking up and downstairs was such hard work. I would be constantly out of breath and it started to impact on my job and looking after my daughter. I knew I couldn't carry on this way for much longer and something had to change. I looked into lots of different diets and having tried most of them I knew this time had to be different. It had to be something that would be flexible and fit around family life. I knew it had to be easy to follow and concentrate on becoming fit and healthy not just focus on weight loss. I wanted to learn how to look after my body. That is when I found Lorna's 8 week Kickstart Programme. It offered everything i was looking for - and more! There are workouts to do at anytime and because they are all online I had no excuses for not fitting them in! I loved filling in the food diaries and getting personal feedback each day meant I began to learn where I was going wrong and little changes I could make. I really love the Facebook group - it is full of ladies like me and we share loads of meal ideas as well as support and cheering each other on. It makes such a difference having a team behind you! Breakfast was 2 slices of white bread with lots of butter and chocolate spread. Lunch would be a whole pizza and dinner was a massive bowl of pasta with cheese on top and garlic bread. I also drank lots of diet coke and wine and would snack on chocolate bars. Not healthy! Now I have overnight oats with fruit and yoghurt for breakfast. Lunch might be a salad with a wholemeal pitta and dinner always involves lots of vegetables with sweet potato and then some protein like a quorn steak (I'm veggie!). I drink mainly water now and I snack on nuts and seeds. I love the homemade no sugar flapjacks in the recipe area - I always have one with me in case hunger strikes! I have so much more energy and my skin is clearer. 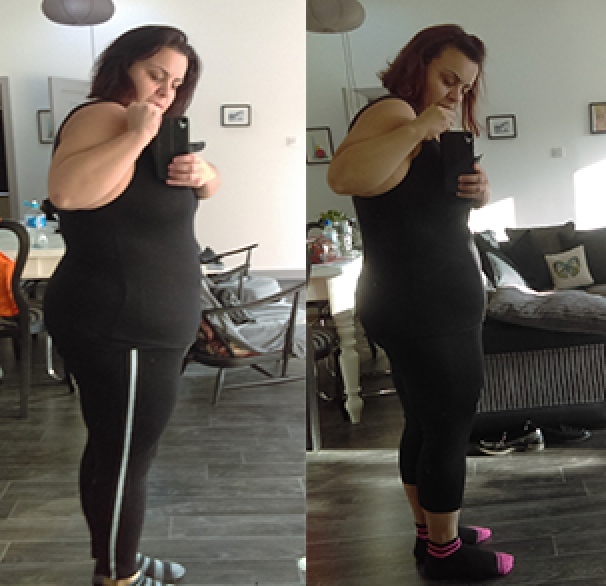 I lost 19lbs in the 8 weeks and lots of inches. I have bought size 14 leggings! My job is easier and I can walk upstairs without getting out of breath. I feel like I am going to be around for my daughter forever and I am beginning to love life again. Don't overthink it, just do it. Start today and look forward to finding the healthier, happier you like I did! Were you inspired by Suzie's story? If so why not start your own journey?